[W]hen these new businesses begin opening in October, all recreational marijuana companies will be allowed to specialize — as wholesale growers without a storefront, for instance, or as stand-alone stores that don't grow their supply. 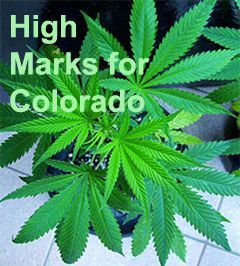 The only requirement is that owners be Colorado residents. 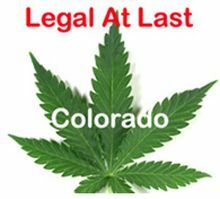 Colorado Governor John Hickenlooper has signed the six bills regulating recreational marijuana passed by the legislature. They go into effect July 1. The bills are House bills 1042, 1238, 1 317, 1318 and 1325, and Senate Bill 283. A short synopsis is here. Maryland has become the 18th state to ban the death penalty since 1976. What happens to the five inmates on Maryland's death row?? The Guardian explains it's an unknown as yet. 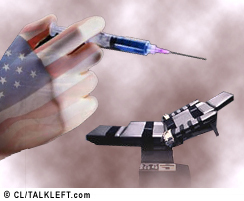 Other states repealing the death penalty in the recent years: Connecticut, Illinois, New Jersey, New Mexico and New York. 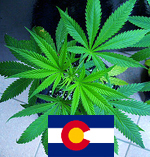 Congratulations, Colorado! Amendment 64 has passed, 53% to 47%. The law becomes effective on the date of the official declaration of the vote by the Governor or December 6, whichever is earlier. The victory party is at Casselman's in Denver, and is open to the public. 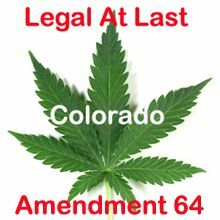 Colorado's Amendment 64, the ballot initiative that will decriminalize personal adult use of marijuana and regulate marijuana sales in Colorado, will benefit the entire state, not just marijuana users. The Colorado Center on Law and Policy report on Amendment 64, concludes that Amendment 64 is likely to produce $60 million in new revenue and savings to Colorado. In addition to creating new jobs, particularly in construction, it will generate $24 million a year in state revenue for schools, specifically the Building Excellent Schools Today (BEST) capital construction program. 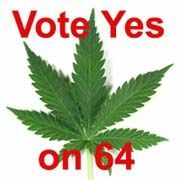 As opponents of the measure launch their final ad blitz this week, take a look at who supports Amendment 64. The Colorado Department of Revenue has issued new rules relating to Medical Marijuana Centers (MMCs) in Colorado. They go into effect July 1, 2011. You can read the 77 pages of rules here. Thanks to Marijuana Policy Project for publishing this list of marijuana initiatives on local Colorado ballots this year. The following jurisdictions will ask their citizens if medical marijuana dispensaries should be ALLOWED – Vote“Yes” on dispensary measures in the following jurisdictions. Update: Goodbye Marilyn Musgrave. Colorado went blue big time and Musgrave, one of the most conservative members of Congress got replaced by Democrat Betsy Markey. Five of our seven representatives in Congress and both our Senators are now Democrats. McCain/Palin didn't even win big Republican counties like Jefferson, Arapahoe and Larimer. That's really something. Bump and Update 10:45 pm ET: The Denver Post also calls Colorado for Obama and Udall. Add 9 to Obama's CNN total, all he needs now is California. The "personhood" amendment is dead. 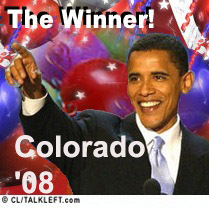 9:42 pm ET: The Rocky Mountain News reports Barack Obama has won Colorado. Rep. Mark Udall will be our next Senator. Hooray! CNN's John King reported earlier the McCain campaign had decided to give up on Colorado to focus on Pennsylvania and other big states. Watching my 10pm local news, McCain is denying it. The regional spokesman for the campaign says McCain will continue to fight for our 9 electoral vote. The station has confirmed that McCain intends to be here Friday. The Public Policy Project poll of Colorado voters I wrote about last night is out. Obama leads McCain, 51% to 44%. Gov. Sarah Palin is tanking his ticket. Sarah Palin's popularity with Colorado voters over the last couple weeks has plummeted, and as it has Barack Obama has opened up his biggest lead yet in a PPP survey of the state. Immediately after the Republican convention 41% of Coloradoans said John McCain's choice of Palin to join him on the ticket made them more likely to vote for him while 38% said it made them less likely to do so. Now the number of people saying Palin's selection makes them less likely to vote for McCain has climbed to 47% with the number of people viewing it favorably dropping to 38%. "As used in sections 3, 6, and 25 of Article II of the state constitution, the term 'person' or 'persons' shall include any human being from the moment of fertilization,"
In other words, a fertilized egg would be deemed a person. The Denver Post, in an editorial today, urges voters to reject it. The three sections mentioned are part of the state's Bill of Rights that protect our rights to life, liberty and property. Simply put, Amendment 48 asks that society grant a free-floating fertilized egg the same protections we enjoy as living Americans. Two weeks ago I did a preliminary assessment of Colorado voters, trying to assess the impact of the state's evangelical voters. I began with the 2004 presidential results. There were 2.1 million voters and Bush won by 100,000 votes. We have 9 electoral votes. The Colorado Secretary of State has these voter registration numbers (pdf) by county, current as of September 2. There are 3 million registered voters in the state. Can Evangelical Voters Win Colorado for McCain? In an earlier post I wrote about Saturday's McCain-Palin rally in Colorado Springs, and how the candidates and speakers, while stressing the importance of Colorado and El Paso County in particular this November, failed to give even a passing nod to the evangelical social agenda. That brings to mind a larger question. The Washington Post reports that many Colorado Republicans on the Western Slope are losing faith in their party. Chief among their complaints is the Bush Administration's support of intense oil and gas drilling activity. Long the most reliably conservative expanse of a state that has gone red in six of the past seven presidential contests, Colorado's western third shows evidence of the "purpling" that has made Colorado look increasingly like a swing state. Colorado now has 32,000 active oil and gas wells. Another 40,000 are planned.